This simple story featuring the joy of learning a new word, and a child’s obsessive love for a favourite toy, is cleverly pitched to entertain the youngest toddler. On a real train ride Elephant is surprised to find animals who cling to cars, planes and diggers instead of what he knows is best, a train. But these creatures are just as firmly wedded to their chosen object as Elephant is. Together, they battle it out in a beautiful shouting match where the favourite words are given full vent with jolly pictures to emphasise their zeal. The kids compete in belligerent disharmony until passing through a tunnel they and their toys land in a muddle and get swapped around. Then Elephant, Cat, Rabbit and Penguins begin to see the merit in other things, learning not only the words for the toys but the most important new word of all – friends. 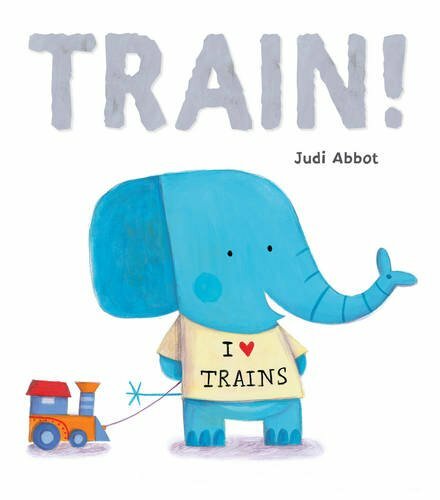 For a toddler whose current passion is trains, this book was a winner, especially when Elephant had a ‘Terrible train tantrum’. (I particularly liked that bit too.) Full of vivacity and fun, the pictures have a warm and comforting feel with their simple lines and strong yet gentle colours. Added to this the rhythmic and bold lines are perfectly complemented by the expressive animals who learn to enjoy sharing and playing together.